Have you ever tried Cheryl&Co. cookies? You're missing out if you haven't. Santa brought me a box yesterday, and I just had a Snickerdoodle cookie that was outrageously good — good enough to blog about! Nice to see that the Chome web browser is finally out of beta. The latest release is their first to sport a "1.x" version number. Everything seems to be just fine using it. LP loads smoothly, animation is as quick as ever. The editor works great (this post typed using Chrome). If you already have an older version of Chrome installed, upgrading to the lastest version is a breeze. Simply click the "wrench" icon in the upper-right, and select "About Google Chrome". Then, at the bottom of the window it shows that a new version is available. Click the Update button. After the update is finished, close and re-open Chrome, and you're done! People who don't have Chrome can visit www.google.com/chrome. Microsoft just released a new version of its IE8 web browser today, but it's only available to people who were accepted into its Partner program (ahem... like me). I finally got the old one uninstalled and the new one installed. In the "About" box it calls this version a "Release Candidate", so that is a very good sign that all the features are basically finished. I'll tell you this: they really did a nice job improving the speed. Pages are loading much, much quicker. Everything is "snappier". This is good news, because a good Internet Explorer is a good thing for everyone! The ONE thing I have found that doesn't work properly is a real headache for me. The Rich Text Editor in Lottery Post shows the wrong default font. I have confirmed that it is a bug, because the same thig happens on the sample pages of the company that builds the editor, so it's not something unique to LP. However, even though the font looks wrong when I'm typing, when I submit the post (like when I submit this blog entry), the font will come out looking right. I've submitted it as a bug, so I'm sure it will get fixed before release. Overall, there are lots of tweaks I've noticed, but I haven't yet had a chance to fully explore. If I find anything major I'll post another blog about it. I'm just so pleased about performance — it's so much better! But they still don't come close to the speed that Chrome, Firefox, or Safari is able to render things like dragging popup windows on the screen. CHICAGO — Illinois Gov. Rod Blagojevich was arrested on Tuesday on charges that he brazenly conspired to sell or trade the U.S. Senate seat left vacant by President-elect Barack Obama to the highest bidder. Otherwise, Blagojevich considered appointing himself. The affidavit said that as late as Nov. 3, he told his deputy governor that if "they're not going to offer me anything of value I might as well take it." "I'm going to keep this Senate option for me a real possibility, you know, and therefore I can drive a hard bargain," Blagojevich allegedly said later that day, according to the affidavit, which also quoted him as saying in a remark punctuated by profanity that the seat was "a valuable thing - you just don't give it away for nothing." 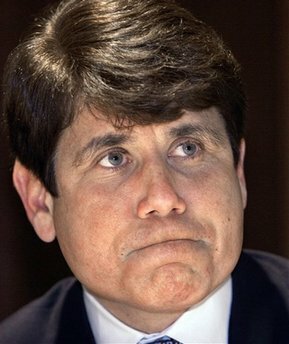 The affidavit said Blagojevich expressed frustration at being "stuck" as governor and that he would have access to greater resources if he were indicted while in the U.S. Senate than while sitting as governor. Messages left for Blagojevich spokesman Lucio Guerrero and at the governor's press office were not immediately returned Tuesday morning. Among those being considered for the Senate post include U.S. Reps. Danny Davis and Jesse Jackson Jr. The affidavit outlined a Nov. 10 call between Blagojevich, his wife, his chief of staff - John Harris, who also was arrested Tuesday - and a group of advisers in which Harris allegedly suggested working out an agreement with the Service Employees International Union. Under the plan, Blagojevich would appoint a new senator who would be helpful to the president-elect and in turn get a job as head of Change to Win, a group formed by the union. The union would get an unspecified favor from Obama later. Nothing in the court papers suggested Obama had any part in the discussion. In fact, Blagojevich allegedly said in the same conversation that Obama most likely would not appoint him as secretary of health and human services or to an ambassadorship because of the negative publicity that has surrounded the governor for three years. One day later, according to the affidavit, Blagojevich allegedly told an associate he knew Obama wanted a specific Senate candidate but "they're not going to give me anything except appreciation." He finished the remark with an expletive. Corruption in the Blagojevich administration has been the focus of a federal investigation involving an alleged $7 million scheme aimed at squeezing kickbacks out of companies seeking business from the state. Federal prosecutors have acknowledged they're also investigating "serious allegations of endemic hiring fraud" under Blagojevich, who has a $177,412 salary, though it's unclear whether he accepts the total. The affidavit also outlines Blagojevich conversations related to Tribune Co., which has been hoping to sell Wrigley Field, the home of the Chicago Cubs which the publishing giant also owns. Blagojevich was quoted in court papers as telling Harris in a profanity laced Nov. 4 conversation that his recommendation to Tribune executives was to fire the editorial writers "and get us some editorial support." Harris is quoted as telling the governor Nov. 11 that an unnamed Tribune Owner, presumably CEO Sam Zell, "got the message and is very sensitive to the issue." The affidavit said Harris quoted a Tribune financial adviser as saying cuts were coming at the newspaper and "reading between the lines he's going after that section," apparently meaning editorial writers. Blagojevich is quoted as saying: "Oh, that's fantastic." "Wow," Blagojevich allegedly replied. "Keep our fingers crossed. You're the man. Good job, John." Harris allegedly told Blagojevich in his conversation with the financial adviser he had singled out deputy editorial page editor John McCormick as "somebody who was the most biased and unfair." After hearing that, Blagojevich allegedly stressed to the head of a Chicago sports consulting firm that it was important to provide state aid for a Wrigley Field sale. He did not have any details about Blagojevich's arrest, only that he was cooperative with federal agents.